The oval looks kool. Do get any frequency interference having all the cars so close together? Last edited by carpetfuzz; 03-12-2005 at 08:27 PM. The race surface is stick-on 12" X 12" vinyl tiles. The rails are PVC and water tubing. The grass is indoor/outdoor carpet. It's all attached to a 4' X 8'-3/8" piece of CDX plywood. Yes, I think that having a micro tracks gallery would be a great idea. And combat tanks would be way cool too. I want to show you guys the stuff I already got for my micros. I use hot wheels cars on my track too. I think there is so much things that can make micro traks better. I find nice "cheap" stuff on the internet that you guys never saw, and I make some of it myself. If you want I can share my sources of info with you guys. So let me know if you guys want me to show my micro stuff. I want to see everyones micro tracks too. I saw local explosion's pictures, and they are so creative!!! This is 18-gears signing off. We've been at it again building tracks. This time it's for the 1/24th and 1/18th size cars. We've made videos (some onboard) of the cars running on each track. You can see them at Dad's Fun Page on the RC Tracks page. **EDIT** - We expanded the narrow track to a Criss Cross Crash based on one of our Hotwheels tracks. Last edited by carpetfuzz; 11-02-2005 at 01:01 AM. 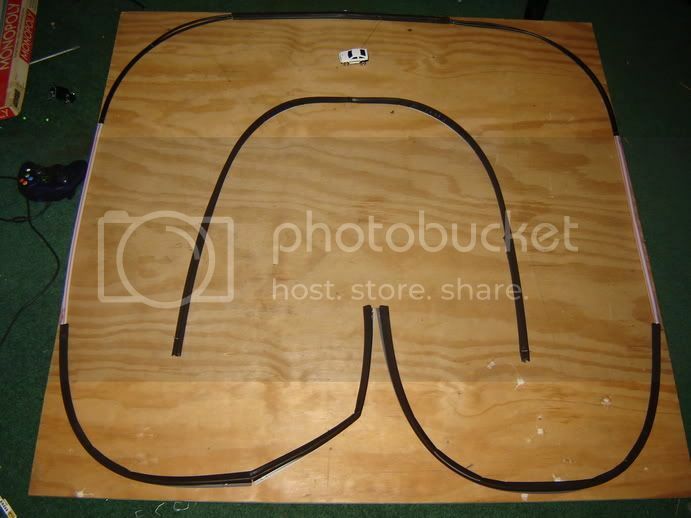 Here's a photo of a new track I'm working with, featuring my ZZ SE... the track is made of sanded plywood, with the rails made out of weather stripping. I plan to "spif" it up a little with some racing environment type stuff, and I might paint the surface grey or black if I get around to it. Hey man thats a cool track how did u make it?